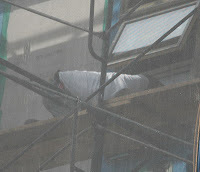 There was illegal work being done around the corner on Grand St on Sat Morning 9/8 as well. A guy in a red truck showed up with a cement cutting machine and made a huge racket heard for blocks around as he cut into the sidewalk. Residents called 311 to complain...here is the interesting thing....the first operator who answered checked and said the building did not have a permit to do the work....then they transfered the complaining resident to another operator to take the noise/permit complaint....The 2nd operator acted surprised that the resident was informed that the building did not have a permit to do the work BECAUSE he said that they were NO LONGER ALLOWED TO tell the complaining resident whether there was or was not a permit for the work!!!! Someone needs to check this out--- Has the Dept of Buildings now made it harder for residents to track illegal work done and helping the developers get away with illegal work??? This is yet another example of the city treating residents like crap and giving the developers anything they want...and of course there is probably some palm greasing as well, but where the hell is Bloomberg!!! If the city government actually becomes functional in terms of safeguarding the quality of life in neighborhoods when it comes to construction and development, it would eliminate so much of our subject matter that we'd have to start doing some serious entertainment and nightlife blogging. The city made it easier in the last few years, actually. Just go the the New York City Dept. of Buildings website and click on BIS (Building Information System). Type in the street, house number, and borough of the building and you can see if the building has open permits.